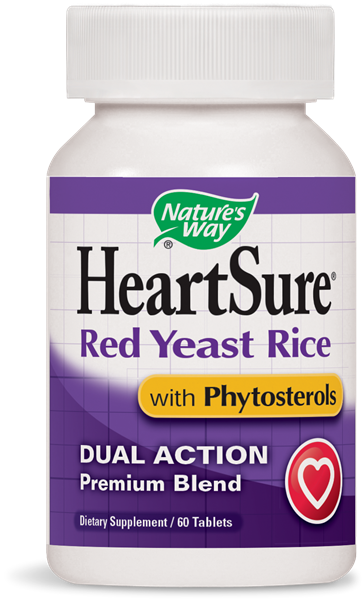 HeartSure Red Yeast Rice + Phytosterols / 60 Tabs - Nature's Way®. Red yeast rice is a substance that's extracted from rice that's been fermented with a type of yeast called Monascus purpureus. It's been used in China and other Asian countries for centuries as a traditional medicine. Phytosterols are natural components in many vegetables and grains—the types of foods known to be traditional staples of the Asian diet. Take 1 tablet twice daily, or as recommended by a healthcare professional. Caution: Do not use if you are pregnant, may become pregnant, or are nursing. Do not use if you have liver disease. If you are taking any medications, consult a healthcare professional before use. Red Yeast Rice contains soy. Twice daily vegetarian capsules with CoQ10 and B-Complex.